I have really been enjoying the eggplants this year. I just had to try and eggplant miso soup. I ended up doing an oven roasted eggplant and mushroom miso soup. Simple oven roasted eggplant is really good. The oven roasted mushrooms added a really nice flavour to the broth. 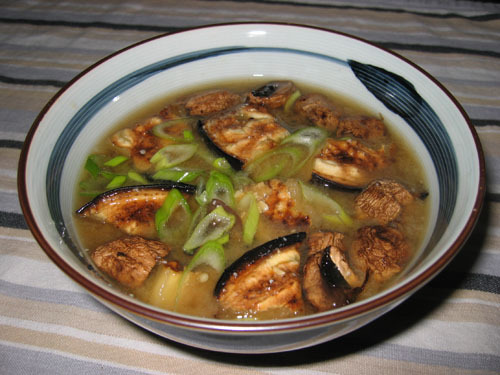 I think that this oven roasted eggplant and mushroom miso soup is my new favorite miso soup! Broil the eggplant and mushrooms in the oven for about 10 minutes. Cut the eggplant into bite sized pieces. Bring the dashi, eggplant and mushrooms to a boil in a small sauce pan. I can see why you are able to have soup for breakfast. It is so quick to prepare!!!!! Looks delicious!!! This looks amazing. I love eggplant. Did you mean "1 slice OF eggplant" or "1 sliceD eggplant"? Sounds really good. Looking forward to making it. Anonymous: 1 slice of eggplant per bowl of soup that you are making.